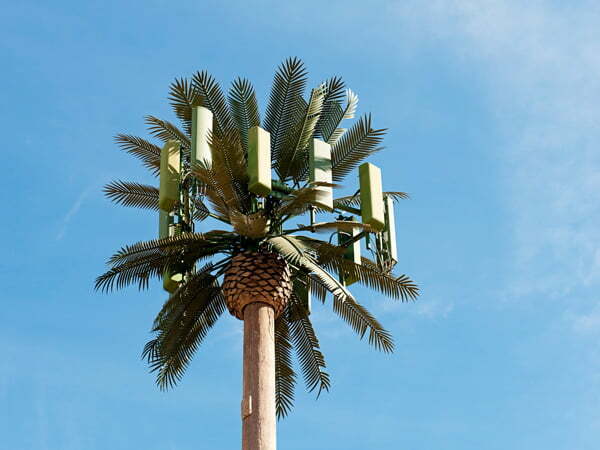 Understanding Verizon’s 4-city rollout of 5G and the 23 city AT&T deployment, being aware of the what frequency WiFi currently operates at and its consequences are essential. Verizon’s 5G recently installed in Sacramento, Houston, Indianapolis, and Los Angeles, operating between 28 GHz and 39 GHz. Studies have revealed 35 GHz frequencies appear to induce immune system problems in rats. WiFi normally operates below 1 GHz. The phone data we use is assumed to be between below 1 GHz and 3.8 GHz. But what happens if you use WiFi hotspot on your 4G phone, does that make the frequency 2.45 GHz? According to the WakingTimes: That’s not an exaggeration, we’re living through a global infertility crisis. That’s another topic and one we’ll cover in the future: just type “infertility crisis” into your search engine, set it to “news” and watch what comes up. There are a lot, and I mean a lot of studies linking the current WiFi that operates around 2.4 GHz to infertility and other immediately noticeable symptoms. TRENDING: US Military Refuses Trump Order to Build Migrant Camp at Southern BorderFor this article, however, we’ve chosen one study performed in Iran, published in the journal Cell in 2015. 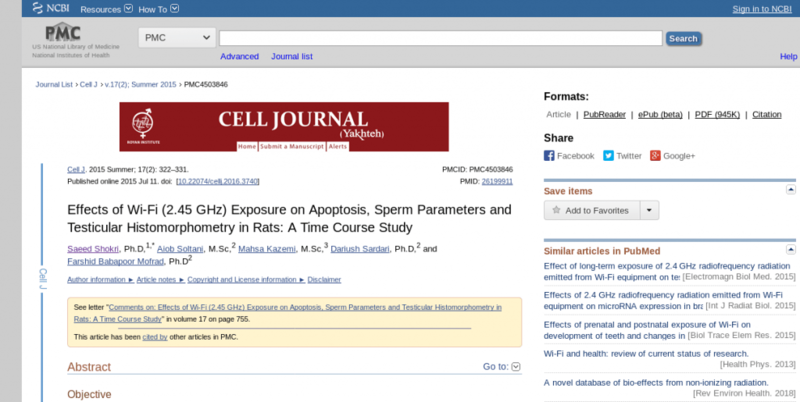 The study is titled “Effects of Wi-Fi (2.45 GHz) Exposure on Apoptosis, Sperm Parameters and Testicular Histomorphometry in Rats: A Time Course Study.”It’s an excellent, straightforward and rich but not too complicated paper, explaining that we need to know the consequences of being saturated in 2.45 GHz radio-frequency radiation. It was conducted at the Zanjan University of Medical Sciences, in Zanjan, Iran, from June to August 2014. In the study, three-month-old Wistar rats were exposed to the 2.45 GHz radiation, sadly, in a chamber that contained two Wi-Fi antennas on opposite walls. The animals were divided into three categories: a control group with healthy, non-Wi-Fi exposed animals, a group exposed to the Wi-Fi for 1 hour a day for two months, and a third group that was presented to Wi-Fi for 7 hours a day for two months. All the animals were studied, for their sperm parameters, caspase-3 concentrations, and histomorphometric changes in their testicles, as well as the apoptotic indexes of the animals. The study concluded that both the 1 hour exposed and 7 hours a day exposed animals showed a decrease in sperm parameters. Even a small amount of Wi-Fi exposure per day on a regular basis damages the sperm of mice, the study proved. “Regarding to the progressive privilege of 2.45 GHz wireless networks in our environment, we concluded that there should be a major concern regarding the time-dependent exposure of whole-body to the higher frequencies of Wi-Fi networks existing in the vicinity of our living places. “Decline in male fertility, as one of the parameters in this study, is considered as a major concern during the past several decades. It has been suggested that direct or indirect exposure to RF-EMW as the main environmental factor plays a dominant role in the observed decline (28). The 2400-2500 GHz radio frequency emitting from Wi-Fi-enabled devices has a long exposure time over a vast area (2, 19, 21). Hence, this transmitted energy can be absorbed by the human body (8, 29).”The decline in male fertility has been considered a significant concern during the past several decades, they said. They found that direct or indirect exposure to these frequencies, as a main environmental factor, plays a dominant role in the decline of fertility, that has been concretely observed. WiFi is influencing a global infertility crisis, and the frequencies are being raised, with cell units closer to our heads and bodies. Now here’s where modern Wi-Fi gets completely insane: 2.4 GHz is the exact frequency a microwave oven uses to cook things. Our Wi-Fi is currently the same frequency microwaves cook our food with; there is entirely no difference between the two except for the concentrated power in a microwave oven to focus the frequencies. What does it mean that our current Wi-Fi is already literally cooking us, like low power microwave ovens, on the same 2.4 GHz frequency? What does it say that it’s about to be raised to the millimeter wave band? This is a model of where a 5G unit will be placed in Houston, but it’s unrealistic because those little cells are going to be installed much closer to our heads, on small buildings and poles. Sacramento, Houston, Indianapolis, and Los Angeles residents are going to have to watch out for that 5G, and soon 23 more cities will have it in America. For more info on what cities will have it, read part 1 on our 5G series here. Please go out of your way to share this information with as many people as possible. It’s that, or helplessly watch our environment, workplaces, schools, be saturated in higher frequencies that do even more noticeable damage. 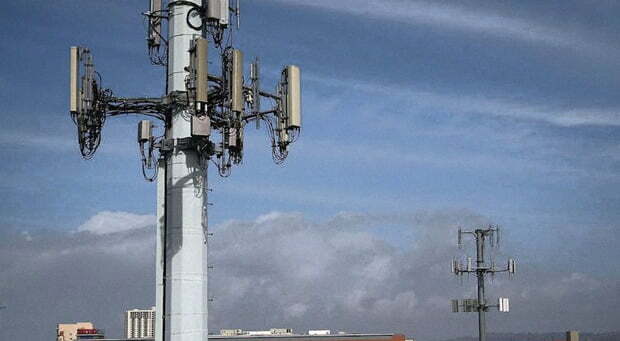 5 G Is an Assault on your very Life could be proven in a court of Law . So you do have Options but the one option you don’t have is to allow yourself to be slowly Killed unless your an Idiot. The corpo rats can impose 5G and its all good? The govern mentals who “should” be “in charge” of protecting the masses obviously don’t give a fkc. The masses may know the information…so what? AS IF getting a bunch of ppl all stirred up is gonna change the way the corporats and govern mentals do stuff. Whatever. The ONLY way I see this stupidity (profit off of misery) being resolved is if we remove the nasty asshats who care not of others. Remove crown and all its vile manifestations, including the lecherous “corpses” (corporations).